If you're looking for a spicy, lipsmacking dhaba style mutton curry? Then you've ended up right with this scrumptiously spicy mutton gravy recipe which is very popular in North India especially in Punjab. This mutton curry is rich in flavors with tempting aroma & mouth watering spicy taste. Its very simple to prepare & doesn't require quite a lot of ingredients. In this recipe, the delicious, soft tender chunks of lamb or goat meat is cooked in Indian style spicy onion tomato gravy. 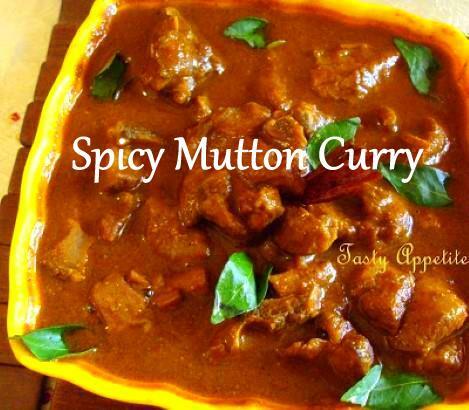 This is how we prepare this yummy mutton curry recipe! Clean and wash mutton thoroughly. Marinate with turmeric pwd, red chilli pwd, yoghurt & salt. Add marinated mutton to pressure cooker. Add turmeric pwd, red chilli pwd, 1 tsp of oil, cumin pwd, salt, coriander pwd and garam masala pwd. Add 1/2 cup of water and cook until mutton is 3/4 th done. Add cumin, pepper, curry leaves, red chilli, green chilli, garlic cloves and wait to splutter. Add sliced onios and saute until light brown. Add freshly sliced coriander and mint leaves. Add sliced tomatoes and saute till the tomatoes are cooked soft. Now add 3/4 th cooked mutton along with masala. Sprinkle dried fenugreek leaves and cook covered in low flame for 10 mins or until the mutton is tender. Spicy hot dhaba style mutton curry is ready. Enjoy hot with roti, paratha, naan or rice dishes.